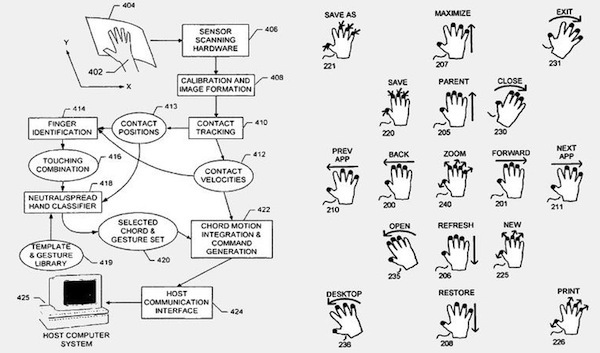 Apple‘s just been granted an important patent on multitouch gestures. This almost ends the debate on who “owns” multitouch, and simultaneously gives us a glimpse into how we’ll interact with slate PCs and touchscreens in the future. As they note over at Patently Apple, the patent, numbered 7,705,830 is going to be an incredibly useful one for Apple. Specifically it covers detecting multiple finger contacts with a touchscreen, and a system for tracking where the initial contacts are and where they end up after a movement, with particular attention to neutral and “spread” finger arrangements. Boil this down to plain English and you get: Sophisticated multitouch gestures. The cleverness inside the patent is that when you plop your fingers down on a trackpad or touchscreen you can either use a relaxed hand position, or a more active position in which your fingers are spread apart. By detecting this subtle difference, an attached computer will be able to discriminate a much more complicated set of gestures than would be possible than by merely detecting multiple finger contacts. Apple even goes as far as noting that the spread, “deliberate” gestures are best left for little-used controls on a computer, since it requires a conscious choice as how to place your fingers down. It’s an important win for Apple, as its multitouch trackpads on its laptops, and on the iPhone and iPad’s touchscreens, have led a small revolution in how humans interact with computers, and many other manufacturer’s are following suit. The IP situation was briefly confusing, with makers declining to implement multitouch on some U.S. Android phones because of Apple’s patents. This latest one will certainly reinforce Apple’s position. With makers like Asus already producing touchscreen desktop PCs, and with strong hints that Apple may implement touchscreens on a future revision of its iMac range, multitouch gesturing is going to become an even more significant tech. And exactly what commands will our jammy, sweaty fingers be drumming up when they dab at the screens of Apple’s future gizmos? Check out the picture below for the answer: A lot. So many gestures that one’s fingers will practically dance across a touchscreen, and you may no longer need ctrl-cmd-shift-key shortcuts. In fact, when you remember that large touchscreens could detect two-handed gestures, some of this touchscreen language is going to be very complex and possibly even tricky to remember. Tom Cruise in Minority Report? He was just a gesture beginner, folks.